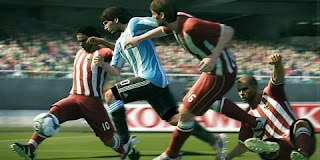 Only Pro Evolutions fan, Michael Broadhead has sent in his suggestions on how he thinks Konami could improve things for PES 2012. Read on to see his thoughts and of course, feel free to leave a comment. The question is, how do Konami go about capturing player movement/physics as best as possible? As the reader, you might have mixed feelings about the idea I'm about to propose, because I admit it seems too simple to make sense. In my opinion, the answer is playing the beautiful game themselves. When trying to re-capture an experience as best as possible, surely the easiest way to do it is to actually immerse yourself in the experience and partake in the activity yourself? Many game developers believe that it's vital to make a game that's as realistic as possible - a statement that I agree with. For instance, for Need for Speed Shift 2, EA got real racing drivers to practically relive every second of what they feel whilst racing, and then give this information to the developers, so they can create the most realistic gaming experience as possible. In my opinion, PES gets most of it's criticism on getting the basics wrong. I understand the developers must not get a lot of free time off work to do anything, let alone play football themselves. From my experience, I've been playing football since I was born, and I learnt the basics whilst growing up. After you've learnt it, things like side-footed passing, becomes so natural to you that you become able to do it without thought. If you look again, Gerrard doesn't move his arms at all when playing the through ball. When you watch players in real life, a lot have their own technique - but especially Gerrard. For all passes (but especially through balls), he drops he left arm and positions his hand down to give him balance which allows him to place the perfect pass. In the same video, look at Rooney's shot. He cuts inside and hits the ball, just like that. It's a great finish, but like Gerrard, his arms are flat. It would be incredibly hard to perform a shot like this in real life like this, with flat arms. Ideally, you'd cut in and swing your left arm to gain momentum. These basic techniques are just few of hundreds things you pick up playing football, when growing up. In this day and age, you would expect things like these to be put right? If you watch, Lampard is walking towards his own goal and then, without turning, launches the ball a great distance down the field - using his weak foot as well! In real life, no player would be able to do that. You simply couldn't gain that much power, after performing a 180° spin. This is probably just a glitch in the system - but I've seen this enough times in PES to know it's not. Don't get me wrong, I think PES 2011 was a step in right direction, and some of the animations in the game are absolutely beautiful. However if basic features like these are corrected, PES becomes a much stronger game, in my opinion. Like I've suggested, the way to solve this is to get the PES team at Konami playing and knowing how these techniques are applied naturally. If not the team themselves (as I understand it is a little far-fetched), get working with more players on motion capture as to be honest, they have perfectly portrayed Lionel Messi within the game - as we all know, Messi is the player that Konami have worked on most in recent years. They've also perfected the motions of Cristiano Ronaldo too, echoing his dribbling motion, as well as his free kick run up style. But surely, the PES developers would be able to portray our beautiful game more accurately, if they had more experience playing football themselves?